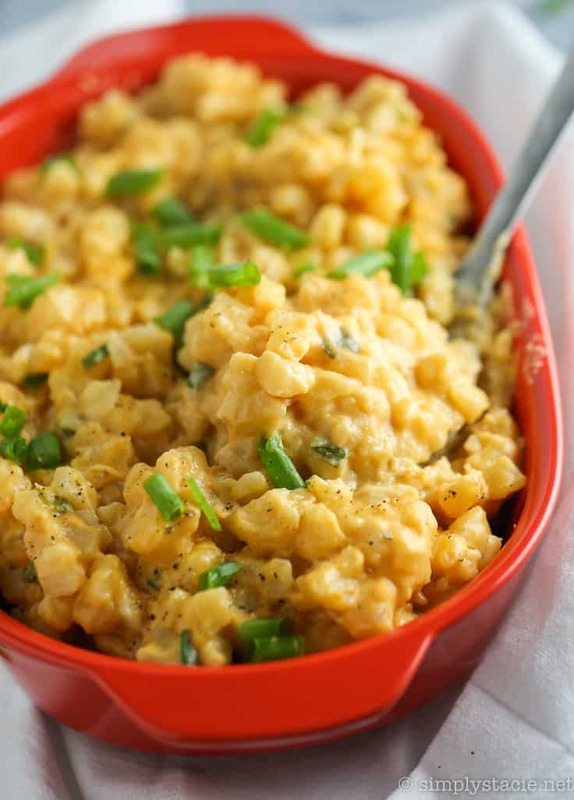 At first glance, this dish looks like macaroni and cheese doesn’t it? I thought so too when I peered inside the slow cooker. It’s actually potatoes – hash browns to be exact. 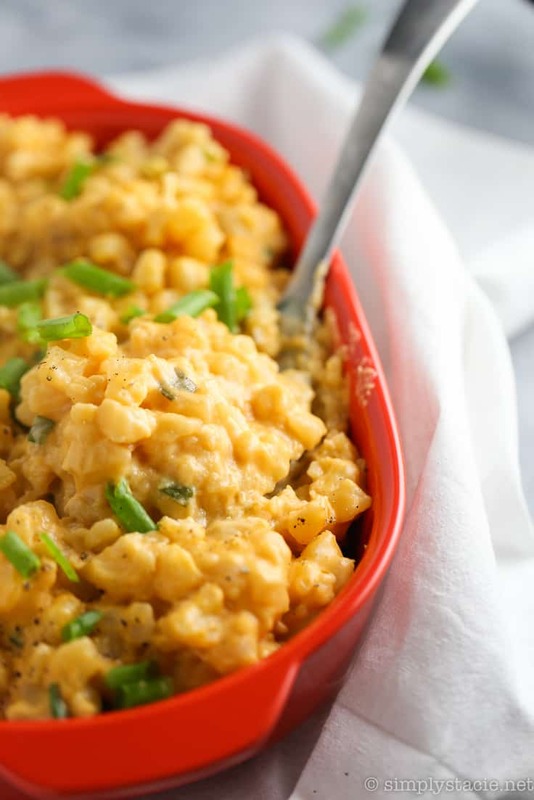 This is easy, cheesy comfort food. It’s literally just dumping your ingredients in the slow cooker and letting it do the rest of the work. I didn’t even thaw my hash browns. I put a whole 900g bag of frozen hash browns in there along with two cans of cheddar cheese soup (yes, it exists! ), evaporated milk and some green onions. Campbell’s makes a cheddar cheese soup you can use in this recipe. Grab two cans at the grocery store. No need to dilute it. You are going to put all that cheesy goodness right in there with the potatoes. I served this side with some Dill Pickle Roast Beef (recipe coming soon!). We had some left over and ate them for dinner the next night too. John, who will never hesitate to tell his opinion on my recipes, gave his nod of approval. For more easy slow cooker recipes try my Slow Cooker Lasagna, Slow Cooker Verde Chicken Chili and Slow Cooker Beef Stroganoff. Now, I’m wondering what other soups would work in this recipe besides cheddar cheese. Maybe Cream of Chicken or Cream of Broccoli? Hmmmm I’m interested in testing these out too! What is your favourite potato slow cooker recipe? 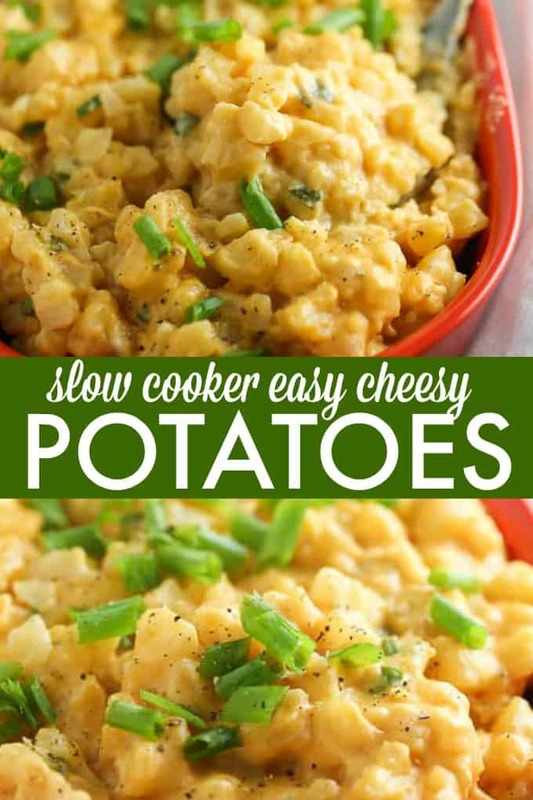 Try this simple comfort food recipe, Slow Cooker Easy Cheesy Potatoes. It’s made with frozen hash browns and cheddar cheese soup! 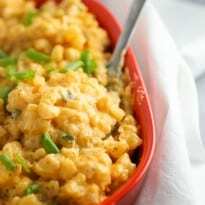 Mix together the hash browns, cheddar cheese soup, evaporated milk and green onions in the slow cooker. Cover, and cook on low for 6 hours. Serve hot. Garnish with green onions and season with salt and pepper, if desired. They look really good, going to try these out over the holidays! 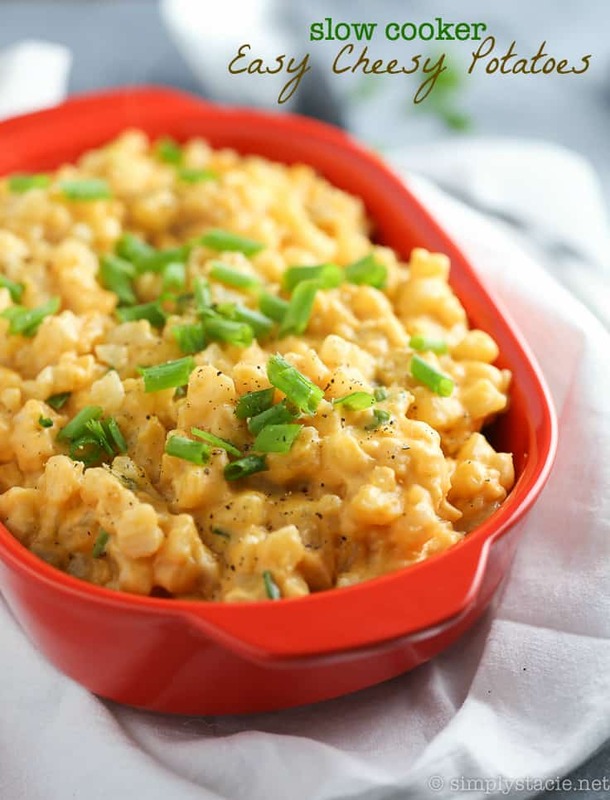 I like this recipe – so easy and not a lot of ingredients! Anybody who did not like these would have to have a majour problem with their taste buds. Sounds like an easy dish to make- might have t try for Christmas potlucks! Now this I can do! Thanks Stacie…Pinned. I have a major thing for potatoes. Could eat them every day but haven’t yet made them in the slow cooker. That obviously needs to change and this looks like the perfect recipe to try!! All that cheesy goodness! Yum!! Wow! These look fantastic! Pinned it and will be making it this weekend. I know my kids are going to love them! My kids would inhale this, thanks for the recipe! This is like comfort food at its best. Yum. These Cheesy Potatoes will be awesome! Thanks so much for sharing your talent with Full Plate Thursday and have a great day. I would never of thought of thought to put the cheddar cheese soup and evaporated milk together but I bet it’s great. It looks delicious ! Thanks for the recipe this sounds rich and delicious !